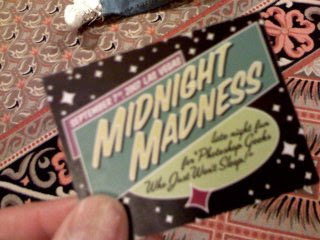 This is a picture of a covetous limited quantity (200 only) Midnight Madness ticket. I only waited a mere 30 minutes for this ticket. After dinner, Allen and I went to lineup at Midnight Madness room. There were only a handful of people ahead of us. We stand a pretty good chance in getting a good seat. Robert Vanelli, the defacto Midnight Madness Security arrived and entertained the crowd. Similar to Boston, they spoofed game shows and reality show. We started off with the Dating Game. Corey Barker was the bachelor, and he picked a pair of bachelorettes because they came as a pair and he was intriqued throughout the game. Next, was Deal or No Deal. A lady went up, and right off the bat she opened the case with the free roundtrip airfare ticket and a pair of Photoshop World ticket to Photoshop World 2008 in Orlando FL. She later passed the opportunity to take the deal for a brand new iPod nano that was just introduced less than 48 hours ago. She ended up winning the 6x8 Wacom tablet. Finally, a rendition of American Idol, titled Photoshop World Idol. Nelson won it in Boston with "Ain't No Sunshine". He started the competition with a couple of verse of that song. Many people got up to compete. A couple was really good, and then several were horrible. In the end, a young woman named Laura won the competition. I actually thought she competed in Boston and was the co-winner with Nelson, and got a free pass to Photoshop World Las Vegas. I thought she had an unfair advantage, and also won a free pass already. Anyway, despite that, we had a lot of fun.